Our custom orthotics work to eliminate pain and last for up to 15 years! Grusky Chiropractic Center, PA is proud to offer our patients the very best in custom orthotics, featuring products from the well-established and highly respected company, Foot Levelers. Foot Levelers offers the highest quality custom orthotic that’s backed by years of research and quality standards. Our custom orthotics are specifically created for each patient and act to eliminate pain and stabilize structure. They’re also designed to last for 10-15 years, making this one of the best investments that you can make to bolster the stability of your structural foundation: your feet. Am I A Good Candidate for Orthotics? Some of the people most in need of custom orthotics are runners, joggers, people that do a lot of standing during the day and those that are generally very active. The process is painless and noninvasive, and involves the use of an accurate laser and photo scan of each foot to make exact imprints. The scan itself is free, and we encourage each patient to request this testing even if they’re not experiencing any symptoms. We believe it’s always better to be proactive and avoid problems before they become apparent. Many people are unaware that once you’ve lost the arch in your foot, it’s gone for good. It’s a smart move to protect that arch and have the pleasure of great foot biomechanics! 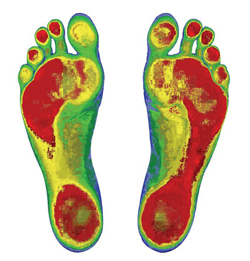 For the best custom orthotics, contact us today to schedule an appointment for our high-tech scanning process!